That’s the definition from Wikipedia!!! Now if that sounded pretty complex, in reality, the institution of marriage is far more complex in India. Chunk of marriages in India are arranged. It begins from the “yes my child has reached the marriageable age”, to the actual event and beyond…. (Well I really don’t know when weddings end in India. The responsibility gets dragged on probably till the couple has their child). The elders in the household get the ball rolling by spreading the word in the immediate social circle. Once a prospective groom (read family) is shortlisted, then the whole rigmarole of marriage begins. I was recently party to one such event in my over enthusiastic “Tambrahm” household. Tambrahm is the nick name given to the Brahmin sect living in the southern state of Tamil Nadu. They have a reputation of not only being intelligent and well qualified, but also traditional and orthodox, conforming strictly to Vedic practices. My aunt made the announcement that her dear son had reached marriageable age. He had a very typical “IIT-IIM” Tambrahm degree, and the only thing she wanted was a girl who was smart, homely, and God-fearing. Well that’s not too much to ask for… Just that the meaning of smart, homely and God-fearing in the Tambrahm dictionary is “a girl with at least an engineering degree, can drive a car, speak good English and debate on current political issues. She should be able to cook up a 3 course meal, make snacks and sweets in ample quantities during festivities. She should adhere to strict religious practices as prescribed in the Holy Scriptures, wear a sari and when required the elaborate 9 yards sari too. She could work…but should be home by 6 pm before the evening lamp is lit and be prepared to retire from work… when the first baby comes. She should also be able to sing during functions such as Navratri and other social gatherings, and make great filter coffee. Oh I also forgot to mention… Follow echal, pathu, madi, accharam … (well these are just different terms a common TamBrahm household uses for rules regarding hygiene cleanliness and general living). So anyways the hunt was on and finally the chosen family was to be met on a Sunday, after the horoscopes of the boy and the girl were matched by the family astrologer. Being a ritualistic person my aunt decided it not appropriate to allow her son to meet the girl before she had met her. So an entire platoon of our family landed up at the girl’s residence. After the customary greeting, the girl whom I shall address as “A”, walked in with a tray of piping hot filter coffee. All eyes were transfixed on her. Did I imagine my aunt ticking off a checklist in her mind? I did see a twinkle in her eye. “Can you sing?” my aunt asked her. Surprisingly most TamBrahms are blessed with a beautiful voice. I must admit “A” sang soulfully. The melody wafted through the air and I noticed my aunt’s smile deepen. When it was time to leave, I noticed “A’s” parents had a look of anxiety. Was it a yes or a no? My aunt held their hands and said, “I will get my son the next week. Let the youngsters talk while we proceed to the next step- the nithchaithartham or the formal proposal to marry.” The parents beamed. A Tambrahm wedding had just been fixed. On our way back home, I asked my aunt what made her say yes to the girl. Here were her reasons. Reason 1: Their horoscopes matched extremely well. They will surely have a happy married life. I find it quite surprising that many parents even today give more importance to horoscopes instead of actually focusing on compatibility. I wonder if horoscopes really reflect compatibility in marriages. Reason 2: She did not use any make up. Did you see that? She is surely a simple girl. Well, use of make up or not, it is purely a personal choice related to dressing. Simplicity lies in one’s heart. I have always known the dislike Tambrahms have towards any sort of makeup. But little did I know that it is a vital criterion in getting a groom!!! Reason 3: She can sing well despite being a qualified engineer. I’d definitely give my aunt a point here. I truly appreciate a person developing their talent, skill, passion or hobby, apart from having their professional life. It is commendable in today’s hectic world. But wondering if this would make someone a good life partner. I pondered to myself. I am not against the system of an arranged marriage. But wish parents would include their children in their decision making process and not force their choices on them. 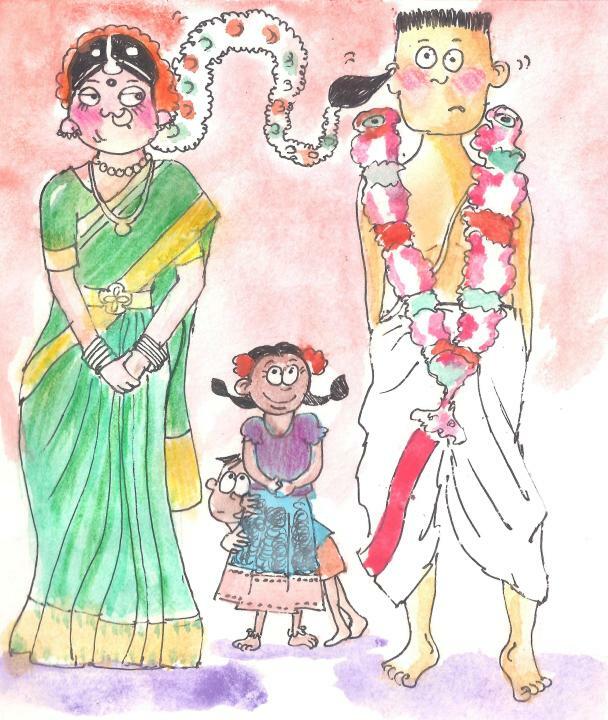 Wonderful rendering Ramya, This is not only the case of Tambrahm sect but it is still existing in other traditional and orthodox families in India where the bride and groom are mere showpieces instead of decision makers. But I am sure, if there kundli was matched perfectly by your aunt, then surely and hopefully they will have a blessed married life. Thanks Janak. As u have mentioned this exists in India across. Agree with your points. The boy and girl must like one another too, rather than parents forcing their decisions on them. That’s an amusing way to put a social cause forward. i think this is the correct approach regarding our traditional things . Instead of discarding every thing we should able to correct the rituals as per todays requirement. Yup, I wish parents would have open discussions with children. We the Tambrahms are so very typical and this post is laced with humour that makes it a fantastic read..
Arana Velarde, sadly no, One 30yr. old I know national school of law graduate, postgrad from Harvard asked her parents find a groom for her, another MSW postgrad, currently working her Phd said the same. Many of my contemporaries with kids of marriageable age say that the kids have put the responsibility on them. Loved your definition of “smart, homely and God-fearing”. Thanks for a great read. Does this generation rebel more against fixed marriages? I can’t even imagine it, but I do find it quite interesting that the girl should be educated, I like that. Fabulous post and I can understand that. Not from a TamBrahm perspective, but any other Indian who has seen how marriages are “fixed” here. Homely means is working and can cook. Gosh! 😀 such double standards. Too much of expectations from a Tambrahm girl. The north Indian Brahmans may not be as intelligent, educated and orthodoxly religious as the Tambrahms but they have the same expectations from their would-be daughter-in-laws. In addition, the bride should bring considerable gifts and cash (which they hate to publicly call dowry) Arrange marriages are a tricky subject but so do Love marriages. And off course the elders know everything which is right for their boys and girls. So what if the boy turns out to be a gay and does not want to marry. Nice post Ramya.. Even in these days, educated girls has to go through this ceremony, that makes me feel bad. I hope, the bride groom will at least talk to A and check compatibility before marriage. Horoscope matching is important even in Andhra. A few Tambrahms are… But majority still need a big shake up..
Its so strenuous. I am all out for love marriages in the future. I see the change in my family where the nextgen is mostly into marriage for love with the blessings of their parents.